It is a living nightmare to be mentally ill. It is an inferno of internal suffering to be in the throes of emotional turmoil. No doubt the multi-layered issues of caring for a mentally ill loved one can test the mettle of the strongest among us. 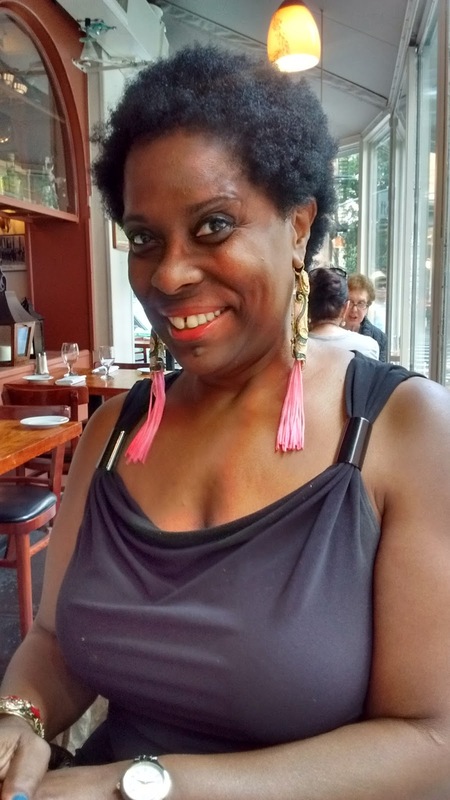 Consider that you and your emotionally vulnerable relative have lived your entire lives subject to the implicit racism of every authority figure encountered. Implicit racism, broadly defined, refers to an individual’s utilization of unconscious biases when making judgments about people from different racial and ethnic groups ... implicit racism is an automatic negative reaction to someone of a different race or ethnicity than one’s own. If your disturbed relative erupts in a violent episode, where do you turn to deescalate your overwhelming situation? If your first thought is to call the police, I question your understanding of implicit racism. I wake weekly to the traumatizing news of police excessive force. The solution eludes me. 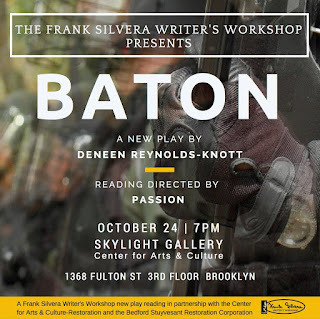 Produced by the Frank Silvera Writer's Workshop, Baton explores intimate relationships in the storm of police abuse of power. 7 PM Mon. Oct 24th I direct the FREE reading of Baton, by Deneen Reynolds-Knott, in the Skylight Gallery, Bed-Stuy Restoration Plaza, Fulton St. Between Brooklyn Ave & New York Avenue. Marki Michelle, Daniel Carlton, Carter Winter, Helene Galek, James Joseph Aquino, Will Young, Althea Vyfus, Dorie Casper with assist by Gaynelle Jasper. I so often have felt the need for another force of strong people who know how to make things better, not worse, who we can call when we need help but don't want anyone ending up hurt or dead. I had a friend who had a scary boyfriend, and when she needed help, we said there needs to be another force of strong people to call. This is awful. CONGRATULATIONS to you for again directing! Police and racism. Gosh, when it's gonna end? Why such big amount of people prefer to close their eyes and don't see the problem. We need to change the whole system, because it doesn't working. I used to make a Perceive Transcript of one article, and it was saying about police problems. They are huge!